" Please welcome, one of Detroit's finest... "
THAT WILL KNOCK YOUR SOCKS OFF! 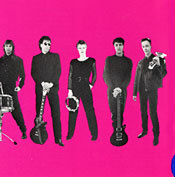 George on lead guitar, Dave on drums, and Pete on bass joined the band from its inception for Lingo, our first CD from 1993. Several of the songs in this set are taken from that debut CD. We rehearsed and gigged a lot for two years before recording the CD, so we simply chose our 12 best songs. I wrote most of the songs, but it was Asta's voice that stamped them all with her unique timbre. The early years were wonderful as we experienced everything for the first time and watched our music and personalities grow together. Fittingly, we start and finish this set with songs from Lingo. "Bumblebee" (�93) This short snappy tune served as the vehicle for our video. This was my earliest songwriting credit that made it into our set. A song about peace, love and freedom. Asta would sometimes clean up the words a bit if the crowd acted a little too friendly for comfort... More - Lyrics - Pix - Video! "She's Eastern" (�95) It was full speed ahead for our second CD as this tune proves. We kept the drums pounding, the guitars slamming and the lyrics intense on "She's Eastern," a song about Ivy League women vacationing in the Caribbean, with geographical references to Cape Cod, Long Island and F.Scott Fitzgerald. We released this song as a 7 inch 45 RPM vinyl single. Jacket cover art by LA pop artist Paul Bob Velick... More - Lyrics - Pix - Video! 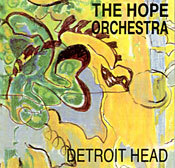 Detroit Head, or head music, or music for thinking people, was released in 1995. We stretched our definition of pop music by quickly moving from straight-ahead alto-rock to cool soprano stylings by the fourth song, nine minutes into the CD. And then, half way through the recording, Tom joined the band on bass. Ray Gale on blues harp. Cover art by Lithuanian artist Danguole Jurgutis. Geoff Michael produced the sound for the first two Hope Orchestra CDs. Lots of good stuff on this one, especially "She's Eastern" and the following three songs. "Brahm" (�95) Asta wrote the words and melody line about an acquaintance from Montreal, I wrote the supporting music. No comment necessary, as the lyrics alone describe it all. A very cool song... More - Lyrics - Pix - Video! "Moonlight Jaunt" (�95) Our second motorcycle song, written from the motorcyclists' perspective, this time a bit more cerebral, almost a lament. Country sounding like the countryside it's written about. Singer Asta's vocals glide through three key changes en route to the soprano kicker I don't want this world to end. Get on a motorbike and head out across the fogbound farmlands and gently rolling hills just after midnight. Or, just play a tambourine... More - Lyrics - Pix - Video! "Wealthy Friend" (�95) Asta's favorite song, a band staple since the first time we played it. Neo-Baroque with lots of orchestration. Birds perch and passersby perk up when Asta sings this one. Anyone within earshot gathers. Saying goodbye to a wealthy friend. This recent version is from our upcoming, soon to be released CD and it has a noticeably slower tempo than the 1995 hyper original. Produced by Michael King... More - Lyrics - Pix - Video! Gift, our 1998 CD produced by Michael King and Danny Cox included fine performances by Luis Resto on keyboards, Walter White on trumpet and Jim Flynn on fiddle and pennywhistle. Danny also played drums and Joe joined the band on bass. 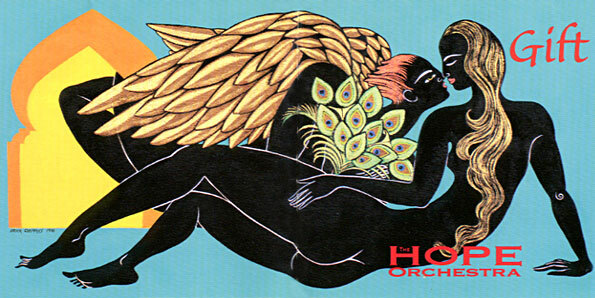 The original cover artwork was created by Erica Chappuis. 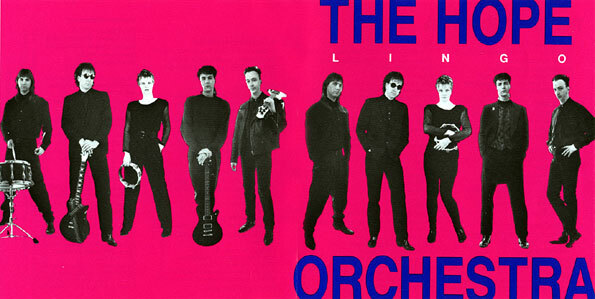 Gift was a major step forward in the identifiable soundscape of The Hope Orchestra. This one uses all the senses (figuratively), and tons of emotion. A beautiful accomplishment for us, and something for everyone on this CD. The next four songs in this set are from that CD, but the eight remaining songs on Gift are equally potent. "Whisper" (�98) George's songwriting contribution to Gift, done in the highly syncopated rhythms that are his trademark style. Drummers beware! On top. Push it. Pick it up... More - Lyrics - Pix - Video! "I Don't Care" (�98) We got one bad review, so of course, I had to respond, and this song is my response. Teachers, critics, all dance the poop. You don't like it? Then you do it! To this day I'm still ticked off about that horrendous and inaccurate review. "Gary, let it go."... More - Lyrics - Pix - Video! "I Can't Save This World All By Myself" (�98) Lord knows I try. All my friends are long gone. Boy, those were the good old days. We'd march and protest at the drop of a hat. No one had jobs, but we weren't stupid. I think this is the penalty for being well-read... More - Lyrics - Pix - Video! "The Narrow Line" (�93) Back to Lingo for the last two songs of the set. This one, about addiction displayed and addressed through repetition, so you end up walking that narrow line. Great blues harp playing from Ray Gale... More - Lyrics - Pix - Video! "This Life You Call Money" (�93) A house rocker. Our traditional set closer, encore, last song, you name it. When we play this, we're done. Soaked to the bone. And we always played it either fast, or faster. Very tight execution by George, quite extraordinary really. All for this life you call money... More - Lyrics - Pix - Video!
" Thank you! Good night! " Home Page | List of Musicians | Latest Songs | Other Songs Other Videos! 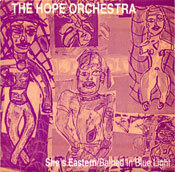 The Hope Orchestra uses EBE piks exclusively!